You've probably seen many versions of the very popular Becky Roberts' Tote-ally Awesome Tote over the past several months. 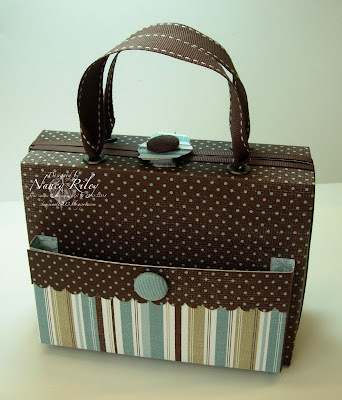 Becky sells the tutorial for this tote, cards & accessories (among other tutorials) on her blog, Inking Idaho. Her tutorials are incredibly detailed and thorough, full color, and super easy to follow. She's a genius! For our March weSTAMP meeting, we decided to do something a little different by putting the "meeting" aside and make Becky's Tote-ally Awesome Tote. Each weSTAMPer made their own tote with their own selection of designer papers. I had a little trouble with mine. As I've mentioned before, I don't stamp well with others and that night was a prime example. Mine ended up in the trash! Well, Ms. Becky Roberts got wind of it, and got alot of enjoyment out of teasing me about it! It was just the motivation I needed to complete the tote in my own craft space ... alone! I tackled the tote a couple of weeks after our meeting, and was able to get around to completing the cards and accessories last weekend. Becky will be so proud when she sees it !!! I'll be sending my tote to my mom ... I intended to have it done by Mother's Day ... then by my mom's visit to Phoenix last week. Neither happened but am happy to be mailing it to her now! 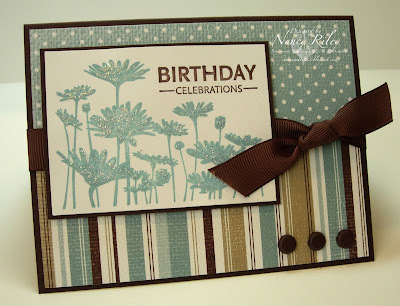 I didn't stick with one stamp set for my cards and accessories, but did stick with the Parisian Breeze Designer Paper. You certainly redeemed yourself....this set is awesome! I do believe you have redeemed yourself...and pretty much to the highest level. This is AWESOME!!!!!!! Holy Cow, you really can stamp ☺, just not with others. 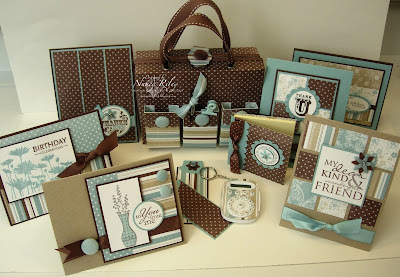 I love the Tote done in the brown polka dot paper and all the different cards. It is just beautiful Nancy! Excellent job my friend!! I have also purchased this pattern from Becky. I have yet to make it, and this inspires me to jump in and do it. I really like what you have done with it, and all the cards. A couple of those cards, I want to just case...ha ha ha So cute. Thanks for sharing. Holy moly!!! Incredible set!! Love this!!! Just a SUPERB WOW! This project is gorgeous! Amazing tote, Nancy! I may have to check out the pattern for this:) Thanks for sharing! Great set, the cards are beautiful and the whole presentation of it all is wonderful looking! Well, my jaw is sufficiently sore from dropping on my desk! repeatedly. Absolutely THE most fabulous project I've seen in a while! WOW! This is really awesome!!! Thanks for the link and it's really well done! This is incredible! What a great set....you may have tempted me to try one of her patterns! I am like you....at my last downline meeting, EVERYBODY else was able to make the pop-up cake die....I just couldn't get it to work and IT ended up in the trash too! 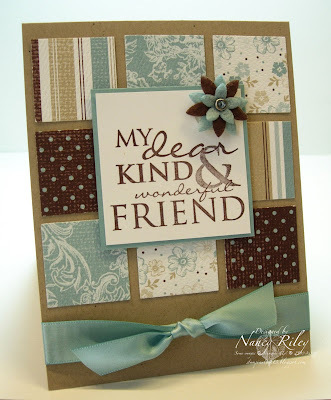 Your card samples are just wonderful! Wow Nancy, this is incredible. No matter how long it took the end result was well worth the wait. This is so freakin AWESOME!! Love it girlfriend. You did an amazing job- I am inspired to try this, although it looks difficult! You mom will LOVE it!!! You are just awesome. I have been thinking about getting the template on this one...now I think it is mandatory! Fantastic (as always)! This project was TOTE-ally worth the wait! How in the world did Becky hear about that night all the way from AZ???? Hmmm..... Anyhow, wish I could be a fly on the wall when your mom receives this gift. It is simply gorgeous!! Wow! Nancy that's amazing! I've seen these before but yours is the best! I'm going to have to get that tutorial now. This is a beautiful project! Your mom is going to be thrilled! Wow - ein wunderschönes Set. Toll gemacht. OMGosh! this set is absolutely wonderful! oh my gosh...this is GORGEOUS! beautiful job, Nancy! 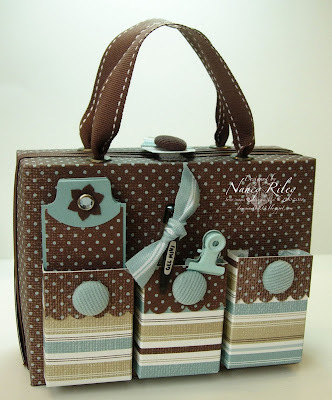 WOW Nancy, this set is just gorgeous - your lucky mother!! (or at least some of these beautiful cards). I've been planning on doing this set for weeks now so will have to at least attempt it! Thanks for sharing. Wow! Simply gorgeous set! Love the colors, they works so well together, and I just can't take my eyes away! What can I say that hasn't already been said except I wish I was your mom!!! I'd be over the moon to receive something this GORGEOUS as a gift!! You sure knocked this one out of the park!!! WOW! Your Mom is one lucky lady!! Awesome job Nancy! Nancy, that is really incredible- WOW, all that detail! Love it! 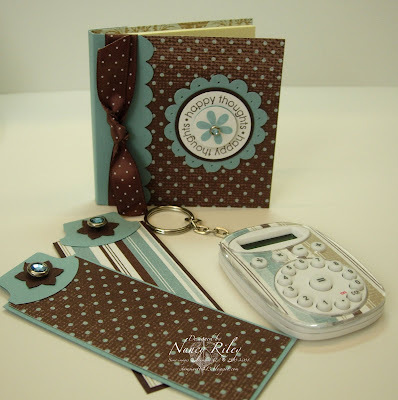 What a fantastic project Nancy! WOW. She will be blown away, so much love and effort into all those great pieces! Wow! Nancy this Set is so gorgeous. Es ist ein wunderschönes Set und das Papier passt so gut dazu. WOW! This is a fantastic project! Your tote and all the accessories turned out perfect! OMG Nancy! This is simply amazing! What a fabulous gift for you mom! She's going to be blown away with this. All of your cards are stunning. I just love that Parisian Breeze DP. I think it's one of the best DP's SU has ever done. Oh, Nancy, this is fabulous! Your mom will be so happy to receive it. 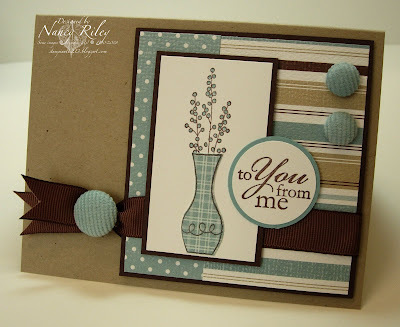 Love your choice of paper and card layouts. Spectacular! Oh wow! I"m totally speechless! What an AMAZING creation!! Fantastic project! Love the colors, the cards, the case... TFS! This is really beautiful. Although, I can't believe that anything you make would deserve being thrown in the bin/trash! !